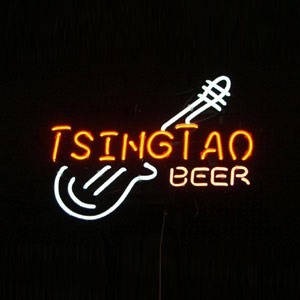 So the word for beer in Chinese is píjiu in (pinyin) or pee-gee-oh (say the oh part fast) ??. If you want it in a bottle say "wo yao ping qingdao", if you want the big bottle add the word da after yao and before ping. Most places just have the big bottle so thats sort of an unnecessary step. If anyone knows a cooler way of saying beer please enlighten me. For instance in the United States we might call them Frosties or barley pops. If you have a 7-11 nearby and know how to say your address just call up and say "song dao wu ping qingdao, <say your address here>". You'll have to order about 5 or 6 because they don't like to deliver anything under 30 Yuan.